A number of authors have noted that recent changes in the liquefied natural gas (LNG) industry are likely to favor shorter term multilateral trades of LNG relative to long term bilateral and project-specific contracts. We present a model in which expectations of such a change in market structure alter investment behavior in a way that reinforces the original tendency. The result is that the structure of the natural gas market could change quite quickly, as happened previously in the world oil market. We estimate the rebound effect for motor vehicles, by which improved fuel efficiency causes additional travel, using a pooled cross section of US states for 1966-2001. Our model accounts for endogenous changes in fuel efficiency, distinguishes between autocorrelation and lagged effects, includes a measure of the stringency of fuel-economy standards, and allows the rebound effect to vary with income, urbanization, and the fuel cost of driving. At sample averages of variables, our simultaneous-equations estimates of the short- and long-run rebound effect are 4.5% and 22.2%. But rising real income caused it to diminish substantially over the period, aided by falling fuel prices. With variables at 1997-2001 levels, our estimates are only 2.2% and 10.7%, considerably smaller than values typically assumed for policy analysis. With income and starting fuel efficiency at 1997-2001 levels and fuel prices 58 percent higher, the estimates are still only 3.1% and 15.3%, respectively. 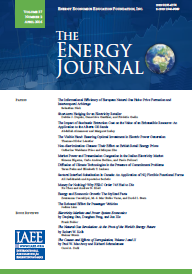 Utilizing load, price, and survey data for 119 large customers that paid competitively determined hourly electricity prices announced the previous day between 2000 and 2004, this study provides insight into the factors that determine the intensity of price response. Peak and off-peak electricity can be: perfect complements, substitutes, or substitutes where high peak prices cause temporary disconnection from the grid, as for some firms with on-site generation. The average elasticity of substitution is 0.11. Thirty percent of the customers use peak and off-peak electricity in fixed proportions. The 18% with elasticities greater than 0.10 provide 75% of the aggregate price response. In contrast to Industrial customers, Commercial/Retail and Government/Education customers are more price responsive on hot days and when the ratio of peak to off-peak prices is high. Price responsiveness is not substantially reduced when customers operate near peak usage. Diversity of customer circumstances and price response suggest dynamic pricing is suited for some, but not all customers. Using a contingent valuation survey, we elicit Swedish households� willingness to pay (WTP) to avoid power outages. In the study respondents are asked to state their WTP for avoiding nine different types of outages. We therefore apply a random parameter Tobit model since there is cross-sectional heterogeneity and a proportion of zero responses. Based on the estimations, we find that the WTP depends positively on the duration of the outages, and that WTP is significantly higher for unplanned outages. The overall variation in the WTP due to observed heterogeneity in housing and socio-economic variables is small compared to the pure effects of power outages. Policy implications of those findings are discussed. This paper explores the relationships among per capita income, energy consumption, and carbon dioxide (CO2) emissions by focusing on a set of economies at advanced stages of development, the U.S. states. Energy consumption and emissions grew 50�60 percent on average over the 1960�1999 period. The states� per capita energy consumption and emissions have grown on average 2 percent annually. The energy consumption income elasticity is positive but decreasing in income, although energy production takes an inverted-U shape, reflecting the electricity imports among high income states. The standard CO2 measure, corresponding to energy production, is characterized by an inverted-U environmental Kuznets curve. Adjusting emissions for interstate electricity trade yields an emissions-income relationship that peaks and plateaus. The carbon intensity of energy declines with income for total energy consumption and the industrial, residential, and commercial sectors. Scarce interconnector capacities are a severe obstacle to transregional competition and a unified market for electricity in the European Union. However, physically the interconnectors are rarely used up to capacity. This is due to the fact that the current allocation schemes make only limited use of the fact that currents in opposing directions cancel out. We propose a �netting� auction mechanism which makes use of this and in which even small transmission capacities can generate large competitive pressure in adjacent markets. Netting increases the usage of capacity and reduces the auctioneer�s incentive to withhold capacity from the auction. How Malleable are the Greenhouse Gas Emission Intensities of the G7 Nations? Why do countries greenhouse gas (GHG) intensities differ? How much of a country's GHG intensity is set by inflexible national circumstances, and how much may be altered by policy? These questions are common in climate change policy discourse and may influence emission reduction allocations. Despite the policy relevance of the discussion, little quantitative analysis has been done. In this paper we address these questions in the context of the G7 by applying a pair of simple quantitative methodologies: decomposition analysis and allocation of fossil fuel production emissions to end-users instead of producers. According to our analysis and available data, climate and geographic size both inflexible national characteristics can have a significant effect on a country's GHG intensity. A country's methods for producing electricity and net trade in fossil fuels are also significant, while industrial structure has little effect at the available level of data disaggregation.